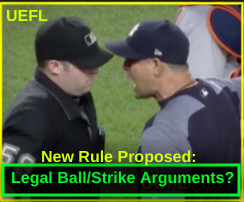 MLB Rules Committee Chair Sandy Alderson, of Mets and A's fame, wants to legalize the ball/strike argument and allow managers to argue umpire pitch calls from the dugout and beyond, putting forth a proposal while citing baseball's status as an entertainment option, and the theatre of ejections and good old fashioned umpire-skipper rhubarbs, as his rationale. Speaking at a presentation for ASU Law School offered in conjunction with the Sports Lawyer Association, Alderson said that thanks to instant replay, "there's nothing to argue about anymore!" Alderson wants to bring that tradition back by legalizing pitch location arguments, which have long been outlawed by the Official Baseball Rules. A ball/strike dispute led to a fight in St. Louis. As umpires know, this brand of bench-jockeying can distract from the game at hand and, in line with general sports psychology theory, can breed further unsportsmanlike actions as both teams lose focus on the task at hand and begin taking aim at each other. Recall HP Umpire Tim Timmons' April 2018 ejection of Diamondbacks Manager Torey Lovullo for arguing balls and strikes. 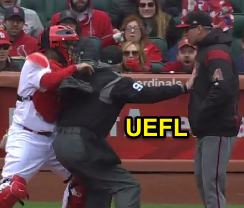 In the top of the 2nd inning, Lovullo exited the dugout to argue several pitch calls and took aim at Cardinals catcher Yadier Molina's purported pitch framing, leading to a fight and bench-clearing incident as Lovullo's comments appeared to incite Molina. As such, where would the line be drawn on ball/strike disputes? Is opponent pitch framing fair game? Alderson has served as Chair of the Playing Rules Committee since his appointment by Commissioner Emeritus Bud Selig in 2005. The Committee also includes Chris Antonetti, Sam Bernabe, Jon Daniels, Jerry Dipoto, Brian Gorman, John Mozeliak, John Scheurholtz, and Joe Torre. Gorman is the umpiring representative.